The most important political conversation Americans need to have is about how the old conversations no longer matter. The Democratic Party and the Republican Party—called the one-and-a-half party system by former Republican Senate staffer Mike Lofgren—largely serve the same interests. The cheap drama of their respective conventions had well-trained actors reciting lines from a tired script. The Republican version claims that an overly regulatory, punitively taxing government never responsible for the slightest good is ready to install padlocks on every business door, detain every CEO, and erect shrines to Karl Marx on top the rubble of every decimated Chamber of Commerce. The Democrats counter this storybook narrative with one of their own: They champion a generous, arbiter of fairness, superhero government that will serve as America’s last line of defense against a vampiric, predatory corporate world of cannibals in Brooks Brothers suits. Regardless of what millionaire cheerleaders on MSNBC and Fox News chant in synchronicity, the dichotomy between big business and big government is now a false one. The old story that the interests of big government and big business collide is antiquated and outdated—a product of a less sophisticated age when mainstream debate still had relevancy, the terms “liberal” and “conservative” had concrete definitions, and the people who wore those terms had real arguments about the substance of governance. Recent revelations and ongoing developments prove that, with few exceptions, there is no collision between big business and big government. There is collusion. Their interests often coalesce, and together they form a nexus of centralized power. A bureaucratized billionaire Goliath then swings his club against the David of human scale community—the David whose job at the slingshot factory was outsourced years ago, and whose rocks were confiscated by the State rock collecting agency. When it comes to the assault on the autonomy of the individual and the security of the family—what Christopher Lasch famously called a “haven in a heartless world”—big business and big government, at least as they function in the United States, make up the blade of a double-edged sword. The big-business-big-government double-edged sword slit the throat of Freddy’s Bar in New York City. Few businesses elevate themselves to the level of communal institution with the consistency of the neighborhood bar. In Brooklyn, the old style saloon, rated the best bar in New York City by the Village Voice and Esquire Magazine, became a home for eccentric friendships, creative nocturnal identities, and camaraderie among likeminded and un-likeminded people. It was a perfect example of successful entrepreneurship. A small business owner provided a sanctuary and service for people eagerly seeking both. He profited by making people happy. Freddy’s enriched the lives of its employees and consumers, and it improved its neighborhood. A few billionaire real estate moguls decided that they could use the space for more profitable purposes, and the New York City and State governments decided that they too could use the space for more profitable purposes, as in tax revenues. The Atlantic Yards Project, which includes famous recording and touring misogynist Jay Z, invaded Brooklyn with plans for the once New Jersey Nets to become the Brooklyn Nets and play basketball in a new “state of the art” arena that will sit on top of Freddy’s, other demolished businesses, and seized homes. Promises of “job creation” give the ugly fiasco a pretty, but ultimately thin and transparent veil. Cleveland, Detroit, and dozens of rust belt cities have tried top down economic stimuli with convention centers, sports arenas, minor league baseball stadiums, and NASCAR tracks. They’ve all failed miserably, but even if such measures created conditions of utopic prosperity, the principles at stake—personal freedom and communal autonomy—should outweigh financial gains. Those principles did not prevent the United States Supreme Court from ruling in 2005, in the now infamous Kelo v. City of New London case, that eminent domain can expand to any project that will potentially increase tax revenues. The United States government—at all branches—has created a system of normalized abuse and institutionalized corruption. In the ongoing war between the dueling conceptions of citizenship and consumerism, the government, becoming a consumer itself, has consummated its long courtship of big business. Eminent domain is one of its many delinquent and destructive children—running around vandalizing neighborhoods, while he shouts that it is for everyone’s own good. The entire project of big government and big business collusion relies upon a paternalism of “for your own good” lecturing from the powerful to the public. Any protest of TARP and the bailouts for the “too big to fail” banking system is met, by both Republicans and Democrats, by insistences that without giving hundreds of billions of taxpayer money to the people who blew up the financial world, we’d all be worse off. We should just shut our mouths and show gratitude for the wisdom of our protectors on Wall Street and Pennsylvania Avenue. Even if one is unable to question the necessity of bailouts—a big if—that would not justify giving the money away without restriction or supervision. It also would not justify the refusal to include community banks in the bailout package. 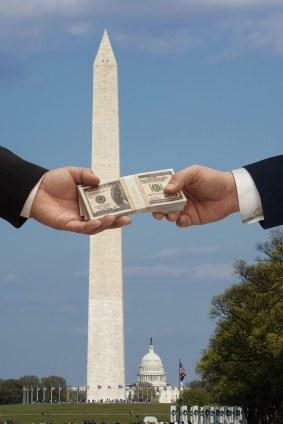 The immediate follow up to the bailouts came from the Obama administration in a stimulus package that again ignored community banks, small businesses, and infrastructural repair, but put money in the pockets of municipal and state governments. First big government took care of big business. Then big government took care of itself. It is a vicious cycle that continues, is seemingly unstoppable, and spins with the velocity of the wheels on a Harley. The American people are the road kill, left with an unemployment rate of close to twenty percent—the official eight perfect figure more than doubles when one takes into account Americans so dejected they are no longer looking for work and Americans who are “underemployed,” working a few hours a week when they desperately need full time jobs. The United States is also one of the few Western countries that do not include its prisoners in the unemployment rolls. Such self-serving exclusion of over two million people is significant considering that, according to the Bureau of Justice Statistics, one out of 32 Americans is in prison or on parole from prison. Nick Gillespie, the editor of Reason magazine, recently called America the “modern gulag nation,” and it has become abundantly clear that the “world’s last remaining superpower” has earned Gillespie’s distinction through the relentless pursuit of its “war on drugs”—a militarized campaign turned against poor citizens and neighborhoods that is not only draconian, but failing. Many commentators and organizations, from the National Review to Amnesty International, have wondered why the American government continues to enforce a loser policy. Congressional sessions and gatherings of the DNC and RNC may not resemble Mensa meetings, but surely politicians are literate. They can read the numbers, and conclude, like any junior high school student, that their policy isn’t working. One of the reasons that Republicans and Democrats have built a “third rail” around the drug war is the profitability of the prison-industrial complex. Big business and big government have monetized the poor and have capitalized on law enforcement by creating a system that incentivizes imprisonment. Private prison companies have become some of the most profitable in the United States, and many of their projects—from the renovation of correction centers to the creation of detention centers—receive the assistance of government subsidy. Governments use tax payer money to help private companies build prisons that will house non-violent offenders, and the kickback comes in the form of stimuli for rural and suburban Congressional districts. The two most dominant concentrations of power in American society serve each other on the backs of the vulnerable—people whose drug problems should be treated medicinally, just as with alcoholism, not criminally. It is a system that creates a situation where bureaucrats, members of congress, and millionaires in business benefit more fruitfully, the more that Americans get sick. Any society that wages war against its own people, and profits from its own people’s diseases, is the one in actual need of diagnosis and healing. The healthcare system would not be a good place to start for those looking for help, however. Ranked 37th in the world by the United Nations, and continually productive of poor results at high costs, the American healthcare system is in dire need of not only repair, but reform. The Affordable Care Act, championed by the Obama administration, contains a few good measures that could have passed through Congress in a matter of weeks, but instead of serving the people, the President prioritized the strengthening of the big government-big business nexus. The individual mandate within the legislation—its most controversial provision—forces all Americans to purchase health insurance. There may not exist a more perfect illustration of the hideous coalescence of big business and big government than the United States government requiring all citizens to buy a product and procure a service many deem poorly designed and badly delivered. In the culmination of the corporate and Statist business model, the government will penalize uncooperative citizens—hold outs who refuse to give private health insurers their money—with a one percent income tax. The mandate and tax is a move of trickery that encapsulates the new system of governance that dominates legislative activity, prevents progress, and tilts society toward centralized power and away from liberty, family, and community. The mandate originated as an idea with the Heritage foundation and became part of mainstream discourse with the usher of Bob Dole, who promoted the cause during his 1996 Presidential campaign. Like Nixon opening China, it would take a Democratic, “change maker” President to make it reality, all while liberals applauded the awarding of a gift to an industry they claim to despise. The duolopy that maintains hegemony over American politics no longer has any connection to the issues of greatest importance to the American people. They won’t engage in serious debate on eminent domain, jobs, monetary policy, and the financialization of the economy. They won’t have a substantive conversation about the worst problems of the health care industry, and they won’t even acknowledge the failure of the drug war. Foreign policy differences, as the aforementioned Mike Lofgren puts it, amount to the Democrats listening to the Republicans and saying, “Me too, but slightly less.” Defense contractors, private army firms, and massive Pentagon funding demonstrate the export of big government and big business collusion. The Republican and Democratic divide no longer has meaning, and the distinction they make between big business and big government to manipulate the public into believing in the actuality of their divide, no longer has relevance. The new project for American improvement must begin with citizens banding together to create an alternative conversation—an alternative conversation that spotlights the dangerous alliance between supposedly differing factions of centralized power. Without this conversation, elections will continue to devolve into contests to see who will emerge as the least reviled character, and invective infected shouting matches on television will continue to resemble the royal entertainment of court jesters and carnival barkers. Political debate will have no resonance with the American people, problems will intensify and multiply, while solutions will become invisible and untenable. The great philosopher Mick Jagger sang in The Rolling Stones’ underrated populist anthem, “Salt of The Earth,” that, for everyday people, elections were the choice “between cancer and polio.” Now voters are able to choose both simultaneously, and get two for one. The real radicalism is finding ways to empower families and neighborhoods, while the real choice is to resist the imposed choice by insisting on the establishment of a new one. Here’s to hoping the conversation can begin over glasses of whiskey and bottles of beer at a bar like Freddy’s. When it comes to solving the world’s problems, a public house feels like the best place to start. David Masciotra is the author of Working On a Dream: The Progressive Political Vision of Bruce Springsteen (Continuum Books, 2010). He has also written for the Daily Beast, Relevant, and The Los Angeles Review of Books. He is a columnist with PopMatters. For more information visit www.davidmasciotra.com. Great piece. I share a lot of these feelings about the nonexistent debate between BG and BB. Growing up in a small family business I saw how the spread of malls and chains slowly destroyed Main Street, and how both parties were complicit in the deal. A Walmart in town makes buying some things easier, more convenient and cheaper. It will create some jobs that will benefit some of our unemployed. But, ten years later, when there are no small businesses left, is our community better? Those entrepreneurs who are now out of business were once the civic leaders of our towns. Now they are department managers at retail chains; they punch a clock and are no longer invested in the community in which they live. People will shop at the chain because they have no other choice. Managers will collect their paycheck, pay for cable and shut themselves off from a world they no longer authentically inhabit. The same principle applies to just about everything- farming, education, health care. We have taken the concept of “community” out of everything, which leaves people fragmented. – if anyone is interested. The conversation has indeed begun; unfortunately, I fear it will take the fleecing of the greater part of the remaining fruits of our labor and further dimunition of our liberties before we are able to do anything meaningful. I sense that many of us are just trying to hold on and consolidate what is left, while attempting to discern exactly how things are going to fall out. Unfortunately – once again – like a habit we just can’t break, or a hardened reflex, we still look for hope in the latest election cycle. As you indicate here, we must come to the realization that what hope we do have does indeed lie with local relationships and alliances, not in distant DC. Farmer Jones and his family tend a 150 acre farm using traditional agricultural practices, growing a diverse set of crops and raising some livestock. From the fruits of this acreage, Jones and his family are able to eat and make a living, with the greater chunk of these fruits going to help feed the surrounding community, which, being in farm country, retains a good balance between the producers of food, services, and manufacturing that make this small town virtually self-sufficient. Life isn’t perfect – and there’s loads of hard work – but the family and its neighbors in both town and country, enjoy a level of community and mutual bonds of affection that are little seen but in storybook or caricature these days. Along comes the Roosevelt (and later) administrations who, in the form of farm subsidies (I’m not even dealing with the Fed here! ), crop limits, and other government support and regulation, increasingly make small farming difficult for the small family farmer, forcing anyone who wants to play to get ever bigger, go into deeper debt, etc. Now the community, and its powers-that-be, including the chamber of commerce, subsidizes, through tax breaks, etc. larger industries and companies (like Wal Mart) to come in and “provide jobs” for the good of the “community”. The small farmer increasingly can no longer compete with the bigger guys; he can’t absorb the costs of regulation and taxation that they can. And after all, the powers-that-be must have their revenue. His land would make a great place for a sub-division (for the good of the “community” of course!) to house all these new workers who will be employed at the new companies, etc. or another business, both of which would bring in more revenue forthe growing town and its leaders. They’ll re-zone or tax the small farmer, for, after all, they are entitled to the revenue they could get from a subdivision or that new business that would like that piece of property. Again, this is for the greater good, remember! Farmer Jones’s son would like to have gone into farming at one time, but he sees what his dad has gone through, and so moves away to take a job elsewhere. Farmer Jones can’t afford the the taxes, and so agrees to sell his land for a nice profit, and retire to one of those new sub-divisions where he can take it easy, and he and his wife can entertain the occasional visits of kids and grandkids, and maybe afford to buy some things they didn’t have the cash for before. Of course he increasingly doesn’t know these new people in his “community”, but, hey, that’s okay – it’s all about . . . progress. I could go further, and I have doubtless left out some important variables in this scenario, but I think the basic dynamics are there. Somebody tell me what I have missed! I believe a serious omission is non-recognition of the effect the Interstate Highway System had on the disruption of small communities, the growth of sprawl (using abandoned small farm land), the tyranny of the automobile, and the necessitated need for more energy than was required before. What we have is simply but ironically quite complexly the old Hamilton versus Jefferson dichotomy. It is nothing new in American history and in American politics. Hamilton’s people won in 1865 and consolidated their gains with the creation of the federal reserve, the income tax and the at-large election of Senators, along with the requisite war to kick things off (WWI). The following is a quote from Dr. John Girardeau on Confederate Memorial Day on 10 May 1871. Allen Tate in his essay in Who Owns America points out that even Marx understood that corporations were the stalking horse for socialism because which legal ownership of the corporation rests with the share holders (citizens) of a country, effective ownership rests with the CEO’s and elites on the board (party functionaries and bureaucrats). Astute men have seen this coming for a long time. Once there was a time when men would give their lives attempting to stop it. Thanks to Mr. Masciotra for an inspiring post and to everyone who commented here for their compelling perspectives. This post is a call to action, and that action is dialogue. Yes, we need to start a new conversation, but to do that, we have to dissolve the specious divisions that defined the old conversation– the cultural attachments and sensitivities that keep people with similar concerns from even realizing they have common ground, much less listening to one another’s ideas. We need to do this because all of our explanations are insufficient, because the problem is massive and complex and must be understood from many angles. For example, I don’t think the whole breakdown of agrarian community in American can be blamed on Roosevelt’s farm subsidies. Industrial farming was being pioneered in the first decades of the 20th century, before those subsidies existed; and the consolidation of farming was modeled on the consolidation that occurred decades earlier in the steel, railroad, and banking industries. But the most important reason to l0ok beyond farming subsidies is that agrarian communities were not the only kind of community that broke down. Indeed, the 20th century has seen the deterioration of community in every sector of society across the industrial world. This phenomenon, which may be one of the most schismatic in human history, cannot be the mere result of some wrong-headed subsidies. It is part of a vast trend with roots far back in previous centuries. All of which is not to dismiss Mr. Smith’s arguments. Having been raised in a liberal household– my father’s father kept a framed portrait of FDR in the living-room when my dad was growing up– it’s quite educative for me to see the ways in which those historical figures presented as heroes throughout my childhood contributed to the mess we’re now in. But FDR’s farm subsidies, and government subsidies in general, and even the rise of giant corporations– all of these things are only part of a very big, very disturbing picture. To being to change things, we must indeed have a new conversation, and as we begin that conversation we must find ways to speak and to define our terms that will break open the old political categories. What matters is not whether you think that FDR contributed to the deterioration of society or I think he worked to resist it– he probably did a bit of both. What matters is that you & I both see the breakdown of community and the replacement of local business with big-name mega-stores as one of the great evils of our times and are ready to work to stop thee things. The beginning of that work is starting a new conversation. I live in Brooklyn. I remember Feddy’s. I like to talk to people. Most of the bars nowadays are too loud for a good conversation. I go to coffee shops instead. I’m happy to sit down and talk with anyone about these issues, any time, over coffee or beer or whatever it takes. David Smith’s points are well taken but there is hope. I am watching more and more people, whether Catholics, Orthodox, Anabaptists, or Neopagans, engage in a bit of a revolution against modern liberalism. The thing about postmodernism is that it is a two edged sword. The death of the myth of progress frees us up to look for other solutions where we had not looked before. Some try a sort of hypermodernistic libertarian approach. Many of the rest of us, feeling estranged from ourselves and our places, cast our eyes back to traditions of old, and whether we find them among the earlier days of the Church or whether we find them in the days before the Church arrived somewhere, we find them. There is, today, a revolution in domesticity, of women choosing to work from home and taking up traditional food preservation techniques, cooking, and the like. There is a revolution in the crafts (I know a traditional shoemaker in Portland, Oregon and maker of beautiful hand-made knives in Vermont). People are supporting these because of the sense of vitality and personal connection which comes out of it. This may sound strange but Distributism as an economic philosophy is taking off among Neopagan religions generally because as we seek a more organic existence it is the only option available. Liberal capitalism is alienating. None of us want that. The very forces of postmodernism that allow a return to the worship of Zeus or Thorr are in fact driving a return to sustainability, self-sufficiency, traditional crafts, and an economy of tradesmen. This will, of course, lead to many interesting discussions, but we can have those discussions and they can be fruitful if we all recognize that whatever our differences in faith, we are coming together for common cause and in search of something similar. And, remembering Jonah Goldbergs fatuous book “Liberal Fascism”, I am struck by the fact that the REAL fascism– the Corporate State of Benito is not different from the Corporation State of tomorrow.